Van Egmond Buxus Soil is composed of various high-quality ingredients such as garden turf, turf granules and clay, fertilized with coated, slow-release fertilizing agents that suffice for the first 3 months. The composition of the Buxus soil creates an optimal air-water mix in the soil, making it just right for all types of Buxus (or box), hedges and evergreen shrubs. 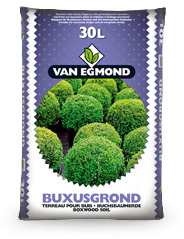 Van Egmond Buxus Soil is available in bags of 30 litres. Order buxus soil directly through our order form!